Railpictures.ca - Bill Thomson Photo: Canadian National U2e Northern 6167 is pictured early in its post-steam era fantrip excursion career, under the Oshawa Railway electric overhead catenary in Oshawa, July 8th 1961. | Railpictures.ca – Canadian Railway Photography – photographie ferroviaire Canadienne. Copyright Notice: This image ©Bill Thomson all rights reserved. Caption: Canadian National U2e Northern 6167 is pictured early in its post-steam era fantrip excursion career, under the Oshawa Railway electric overhead catenary in Oshawa, July 8th 1961. 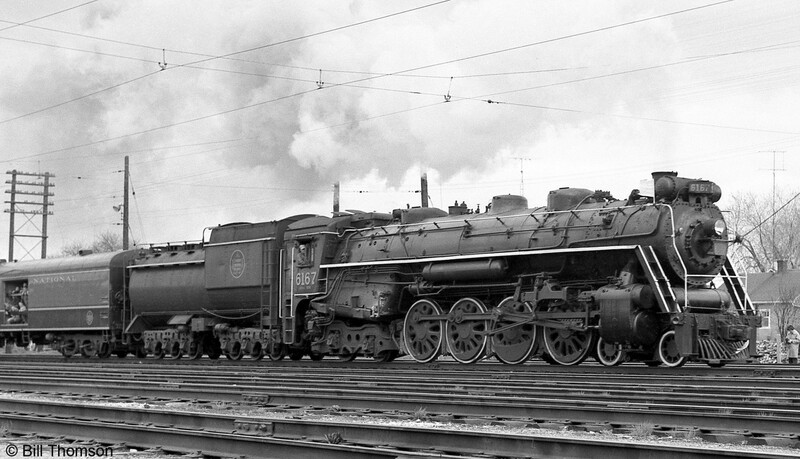 How I would love to see this locomotive returned to service. She’s had a good cosmetic renewal, but not stored for long-term preservation. CNR, kindly wake up?